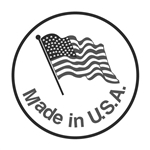 We are proud our complete line of lawn mower blade are manufactured in the USA. We stock Lawn mower blade for all the major brands of lawn mowers made today. Our Lawn mower Blade are one of the highest standards in the industry. Plus we offer the sharpest lawn mower blade in the industry which uses 20% less power saving you money. So buy in bulk and save more. Rotary manufacturers high performance blades that are recognized worldwide for quality, durability and performance. Rotary Corp lawn mower blades are equal or better than OEM lawn mower blades. Our blade manufacturing plant in Glennville, Georgia, produces millions of austempered blades annually from premium grade, high carbon steel. In 1994, our lawn mower blade manufacturing division became one of the first to be certified for the ISO 9000 Quality Standard. Our Lawn mower blades are tested over and over again to meet high standards of safety, efficiency and quality. Our 13 station finishing line applies black oxide with a durable rust inhibitor treatment to every lawn mower blade. A robotic system applies smooth coats of paint; then our lawn mower blades are baked at high temperatures to assure a durable finish. Rotary lawn mower Blades are built to last!